You want to give clients a business card they’ll keep, not spit their gum into. Here’s how you can impress clients with your gold foil business cards. In this digital world, why should you still have business cards? Because they are more valuable and versatile than you might think. The secret lies with creativity. And the creative options are endless with gold foil business cards. It’s faster and easier to share contact information than type (and possibly mistype) the info into your phone. Handing someone your business card creates an opportunity to create a personal bond with a smile, handshake, joke, etc. You demonstrate that you are prepared to do business. So, how do you create a business card that will stand out in the crowd and help the recipient feel good about doing business with you? One option is to use gold foil business cards. 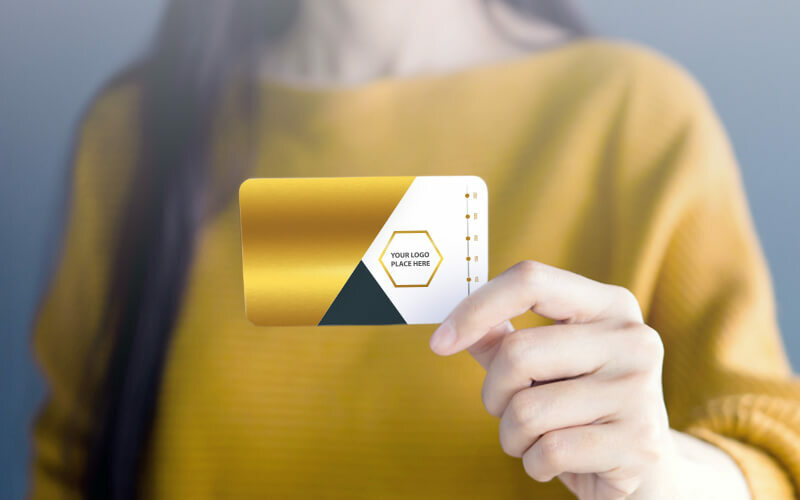 Why Gold Foil Business Cards? Your business card represents you and your company. Each time a person who has one of your business cards looks at that card, he or she will think of meeting you and the conversation you shared. You know your stuff so there’s no doubt the conversation was positive. But if your business card is plain and uninspiring, it doesn’t reinforce the positive experience. Yet, if the person has one of your gold foil business cards, it can inspire confidence. The term “gold foil” seldom means the entire card is gold foil. (Exceptions could be businesses that relate to gold.) Most often, it means there’s an element of gold foil to the card. There are two ways to do this. In the majority of cases, gold foil business cards are made using heat and a custom made block. Instead of ink, gold foil is heat-pressed onto the paper. This creates an engraved look and feel. People who hold gold foil business cards will often run their fingers over the “engraving”. Giving a prospective client a pleasant tactile experience is one more way to leave a positive impression on them. Embossing, another way to create gold foil business cards, can also provide a “must touch” reaction. In these cases, the gold foil is built upon the parts of the card where the design calls for it. There’s a reason why business cards and other “analog” sales and marketing tools such as trade shows and glossy catalogs are still used in the digital age. In-person and tactile experiences can be the fastest way to make strong connections. If given a choice, people will do business with people who leave them feeling positive and confident. They want to know they made the right decision. Gold foil business cards can help you leave the right impression. If your business and brand represent luxury, then gold foil business cards are an excellent choice. When incorporated into logos or other design elements, gold foil can create a sense of excitement and panache. And unlike other colors that can generate the same effect, gold foil also conveys longevity and assurance. Gold foil also tells the recipient that you have invested in your business. You’re here for the long haul. You know your value and want your customers to have confidence in what you offer. Gold foil business cards are not common, so people notice them. Especially if the gold foil is incorporated in creative ways. Business cards have to catch attention in a fast-paced, digital world. So, be creative. Like the divorce lawyer with a business card that can be split in two — one half for each spouse. If it aligns with your brand, don’t stop with gold foil business cards. You can incorporate gold foil into the design of other marketing materials such as office signage and product packaging. What does a paper-based business card have to do with social media? If your gold foil business card is beautiful (and why wouldn’t it be?) show it off. Find creative and appropriate ways to post it on Instagram. Include it in photos added to tweets. You could start with a simple shot of the card fresh from the printer. It’s an easy way to convey your dedication to quality and to get your brand in front of more eyes. After that, try to not make the business card the focal point of the image. Make it noticeable but the photo should be about something else. And if you can get a shot of someone holding your business card in an authentic way, all the better. It tells the viewer that you are a real business with real customers. Gold foil business cards are a great choice for many companies. The most important thing to remember: seek quality. Choose paper stock that suits the design and will enhance the look of the card. This is true for gold foil business cards or any other kind. If you want a business card that makes the right impression, stay within your budget but don’t skimp on details. Invest in quality. Ready for quality business cards that will stand out and not get tossed in the bin? Contact us today! We service all of Upper Coomera and surrounding areas.